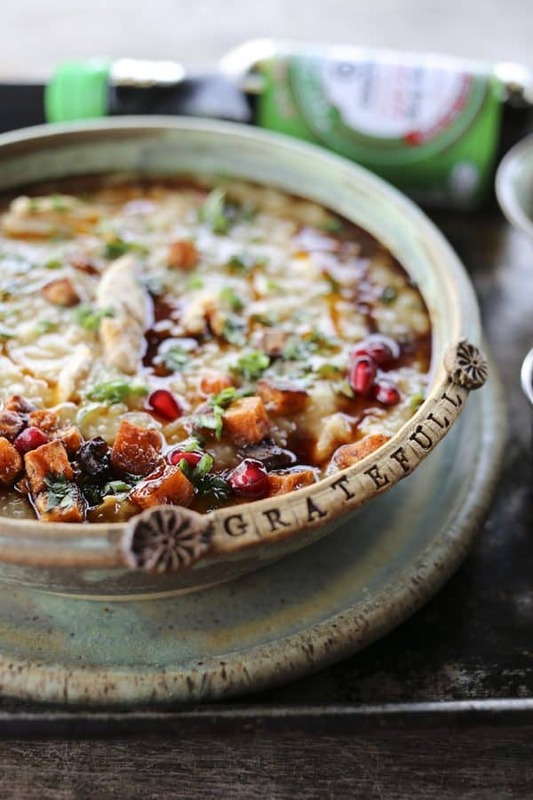 Love this Leftover Thanksgiving Rice Porridge? Check out our other excellent Korean Food Recipes! Here because you have leftover smoked turkey? This is a GREAT recipe for what remains! Oh, how I love Thanksgiving. I plan for weeks ahead of time to make a memorable and delicious meal. I prepare foods for days leading up to Thanksgiving Day itself. As much as I love it, I am definitely ‘cooked out’ by the end of Thanksgiving Day. 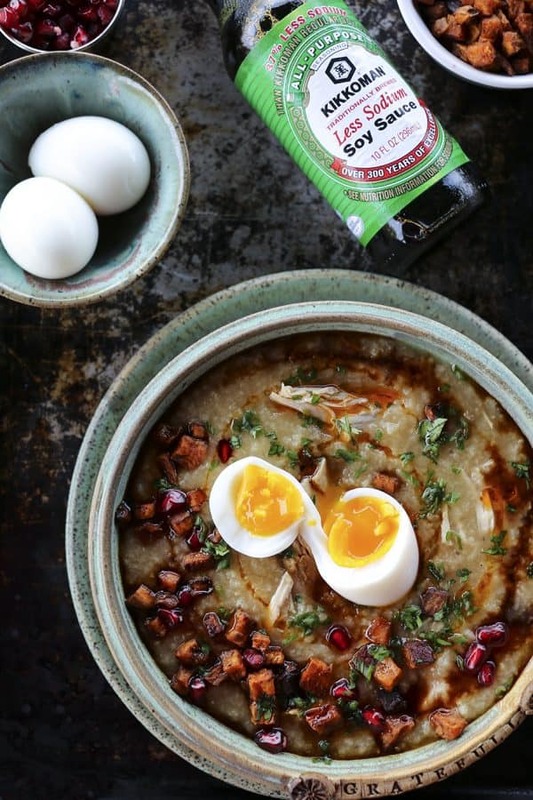 Of course, we have leftovers to nibble on for days to come, but we have a part of our extended Thanksgiving tradition that our family looks forward to just as much as the feast itself: savory Leftover Thanksgiving Rice Porridge, also known as Juk or Congee. 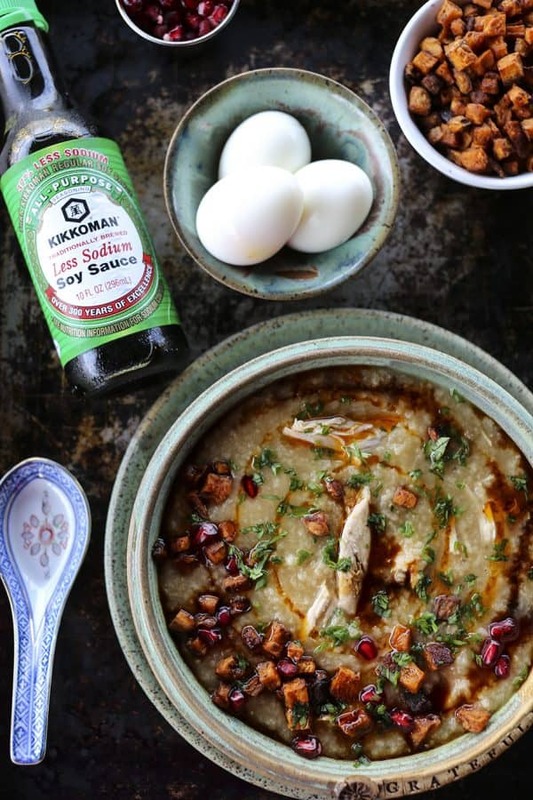 Leftover Thanksgiving Rice Porridge is one of those recipes that make you feel a little like a magician. We put the picked over turkey carcass into a slow-cooker with a little bit of uncooked rice, a piece or two of ginger, a generous splash of Kikkoman Less Sodium Soy Sauce, and water, then cover it and turn it on low before we head to bed. In the morning, whatever little meat we hadn’t managed to eat from the turkey has fallen off the bone of its own accord. The rice has transformed into a thick, hearty soup or porridge that has the incredible ability to keep your stomach satisfied for hours. This is a loaves and fishes moment. A tiny cup and a half of rice and a turkey carcass that looked like nothing else could be wrung from it have combined to create a dish that can satisfy an entire household and guests with so little hands-on time that it’s almost laughable. How exciting can rice porridge be? Honestly? VERY. It is one of the most commonly eaten breakfasts in Asia for many good reasons. Yes, it is insanely economical, but it doesn’t get to be that widely eaten without also being incomparably delicious and comforting. 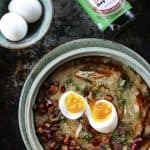 Leftover Thanksgiving Rice Porridge has the unique ability to deliver that comfort and bring a touch of Asia to our Thanksgiving traditions to honor my family’s connection to Asia through my sister, brother, and sister-in-law. You can stop right there with that delicious and humble Leftover Thanksgiving Rice Porridge, if you’d like. With a little drizzle of soy sauce, it is pure soul food at this point and one of the best sick-day foods in the entire world. If you want to dress it up a bit (because, while delicious, it is admittedly not a glamourous looking dish when served on its own), you can serve any or all of the following on top: thinly sliced green onions, soft boiled eggs, toasted or spicy sesame oil, and fresh cilantro. I like mine with all of the aforementioned, plus some leftover roasted sweet potatoes and pomegranate arils. The key to Leftover Thanksgiving Rice Porridge, though, is not to overthink or over-engineer the whole thing. It is simple. It is pure comfort. Use what you have on hand and it will not disappoint. It is one of my favorite parts of Thanksgiving. And unlike Thanksgiving Day, I can eat this in my pajamas with no plans for the day other than a good book and a comfy chair. The Leftover Thanksgiving Rice Porridge can be made in the slow cooker overnight or in a deep, covered pot on the stovetop. Either will work. My preference is the slow cooker because I love to wake up to my rice porridge, but that is simply logistics. It tastes equally wonderful whether simmered on the lowest setting possible on the stovetop or in your slow cooker. You can use whichever long grain, uncooked white rice you prefer as long as it isn’t instant. I like both jasmine and basmati for the job. I’ve not had much luck using brown rice because the intact bran seems to keep the porridge from becoming quite as creamy as I like it. Eggs are not strictly necessary on Leftover Thanksgiving Rice Porridge, but I sure love them. For a perfect soft boiled egg, bring about 3 inches of water to a boil in a 2 quart saucepan then lower the heat to a simmer. Carefully lower 4 or 6 eggs into the simmering water and set your timer for 6 minutes. At exactly 6 minutes, use a slotted spoon to transfer the eggs into an ice water bath just to make them easier to handle. Use a spoon to tap all over the egg, breaking the shell, then peel. The eggs should be perfectly soft boiled. If poached or fried eggs are more your thing, they’ll be just as delicious on top! Both for seasoning my Leftover Thanksgiving Rice Porridge and for drizzling over the top, I prefer Kikkoman Less Sodium Soy Sauce. I like the umami goodness it imparts without leaving my porridge a salt bomb. I use so much Kikkoman Less Sodium Soy Sauce that I buy it by the gallon almost quarterly. I’m a Kikkoman fan girl, really. It’s not obligatory to put roasted sweet potatoes on your Leftover Thanksgiving Rice Porridge, but I do so love them there. I am likeliest to top my porridge with a handful of my Roasted Sweet Potato Croutons. They’re pretty and they’re a fun textural and taste addition, plus I almost always have them on hand. As for which leftover turkey to use, I’d say go for whatever bird was on your table, obviously. If you’re looking for a delicious and simple turkey recipe, you can try our Cranberry Spice Rubbed Turkey Breast, or this, or this! Speaking of the turkey carcass; on the off chance that you haven’t already, please remove any excess fat or skin that remains on the bird. 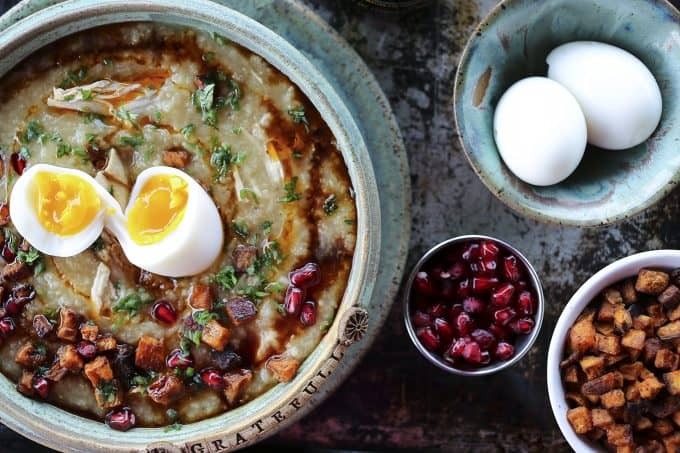 You don’t want a super-fatty rice porridge. Or maybe you do? Who am I to say? I should say “I” don’t want a super-fatty rice porridge. I prefer to add my oil later in the form of chili oil. Oh, and it should go without saying, but I’ll say it anyway for safety’s sake. Any time you make a soup stock or anything else from a turkey carcass there’s a small chance of little bones falling into the broth. Just eat like you would eat any homemade chicken or turkey soup; carefully. 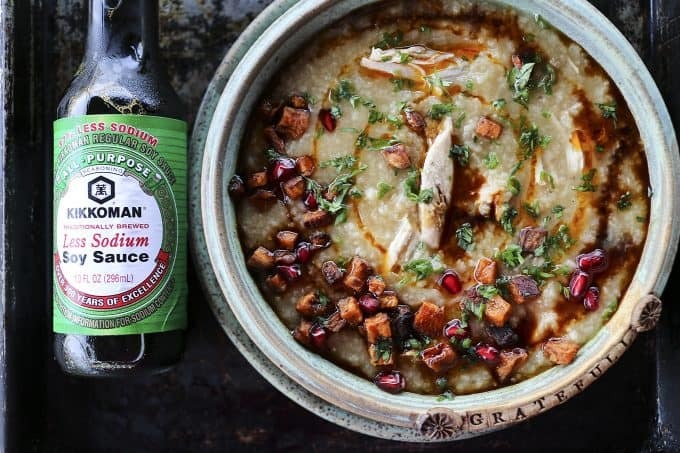 Leftover Thanksgiving Rice Porridge magically takes a leftover turkey carcass and a little bit of rice and water and transforms it into a hearty, creamy, and delicious meal. Place the turkey carcass in the slow cooker. Pour the rice around the edges of the turkey and place the pieces of ginger root on either side of the carcass. Pour the water and soy sauce over the top and sprinkle with the kosher salt. Put the lid in place and set heat to low. Cook for as few as 8 hours but up to 10. Use a slotted spoon and tongs to remove the carcass from the rice porridge. Pull away any meat that remains on the carcass and return the meat to the slow cooker. Discard the bones. Stir well. Place the turkey carcass in a deep pot. Pour the rice around the edges of the turkey and place the pieces of ginger root on either side of the carcass. Pour the water and soy sauce over the top and sprinkle with the kosher salt. Put the lid in place and set the burner to medium high. Bring to a boil, lower the heat, and simmer for 3 hours, stirring occasionally. Use a slotted spoon and tongs to remove the carcass from the rice porridge. Pull away any meat that remains on the carcass and return the meat to the pot. Discard the bones. Stir well. Ladle generously into serving bowls. Top each serving with as many or as few of the optional garnishes as desired. Store leftovers tightly covered in the refrigerator. This post originally published November 1, 2016. Updated November 22, 2018. 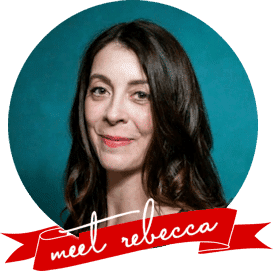 Oh, Rebecca, you’ve outdone yourself, girl! We’re so used to having those awesome turkey sandwiches with all the fixin’s the day after, but I’m loving this! It is definitely comfort food at its’ finest and I can just picture myself snuggled up on the couch under a blanket while it’s snowing outside with a bowl of this warming me up. Perfect! Thanks, sweet lady!! We have the sandwiches, too, but when the meat is really picked over, we plunk the bones into the pot for this! My fave recipe for T-giving leftovers is a mashup of everything into a casserole — the turkey, spuds, stuffing, vegetables, and if there any gravy, pour it over ! Yumtastic. I just love all the leftovers. Any leftover, any time. I’m a leftover apologist-evangelist. My favorite leftover Turkey recipe is Rebecca’s Turkey Pho recipe. Holy Mary. I will buy a turkey just to have leftovers so I can make this. Very excited to try this porridge this Thanksgiving too!! My fave T’Day leftover recipe is for a turkey pot pie – pie crust bottom, leftover mixed veggies, little chunks of turkey, gravy and a mashed potato topping. Makes me a happy camper. Recipes that utilizing leftovers in a new and unique way are my favorite. 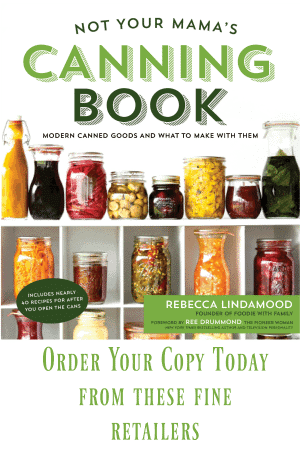 So often we are tempted to toss things out that can really be repurposed into something different but equally delicious! Love what you’ve done here with the turkey carcass — a part I don’t always use, as much as I hate to admit. Thanks for this wonderful idea! Exciting, you say? 🙂 I’ll have to try this! And I LOVE that second photo! That porridge looks soooo good and I think I shall have it! It may become my new favorite leftover, but as much as I love all of the usual, I think I’m most fond of cold dressing. I can hardly wait. Kikkoman is my FAVORITE brand of soy sauce! We go through so much of it in my house. Soy sauce on everything! This porridge is gorgeous! I am loving the flavors! I love Thanksgiving leftovers! My boyfriend loves soup but I’m partial to the next day sandwich! I can just keep doing the turkey, gravy, stuffing, and mashed potatoes forever, never get tired of it! I usually use the carcass for soup broth, but I love this idea for a porridge, and I can’t wait to try it! This is such a genius idea! By day two of leftovers, I’m usually wanting some different flavors so this is perfect! Where did you get that wonderful “grateful” dish?! That is from my all-time favourite pottery shop located in Angelica, NY. It’s from Three Clay Sisters. Here’s a link to their facebook page! I need to save this recipe for our Thanksgiving leftover this year! This is such a unique recipe. You didn’t let anything go to waste and the new flavors sounds wonderful. Thanksgiving leftovers become open-faced turkey, gravy and cranberry relish sandwiches. Sooo good! I love hot turkey sandwiches. Simple, but delish! This is GORGEOUS. And yeah, I had to come comment to get in the drawing. I could really use that card this year. Favorite leftovers… I give away a lot of the sides to my mom and sister. But the turkey, I try to stretch out for a few days because it’s so dang good. Turkey noodle soup, turkey salad with lots of red onion and dijon, turkey enchiladas. Ugh, I can’t wait! Wow! I will definitely have to try this after thanksgiving!! Rice porridge/jook/congee– what ever you call it, this is one of my favorite foods in the whole wide world. I love your version- it just looks so flavorful and totally delicious. Can’t wait to try. I love to make turkey tetrazzini with Thanksgiving leftovers. I like to make simple Shepard’s pie with Thanksgiving leftovers. I like to make casserolewith Thanksgiving leftovers. What a brilliant leftovers idea! Anything with soy sauce get my vote. As for Thanksgiving leftovers, we always make a big pot of turkey and corn chowder. Comfort food! we have a secret family recipe for our turkey and it’s amazing! We like using our leftover Thanksgiving ham for our breakfast egg casserole. Anything that’s left on Sunday night goes into a turkey hash: cut turkey into cubes, brown in butter/olive oil. Add stuffing, also cut into cubes, sweet potatoes same, Brussels sprouts, corn pudding cubes and sauté the whole thing until browned. The same but different every year!